American Samoa is a tropical paradise waiting to be discovered. 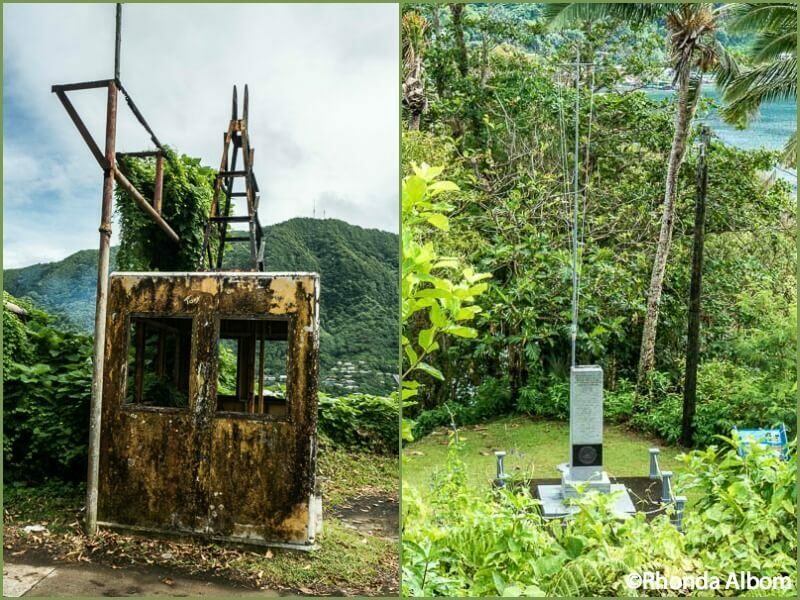 Situated in the southern Pacific Ocean just east of the dateline, it’s a small unincorporated US territory that many people don’t even know exists. For me, it is the lush green hills, warm turquoise waters, and a blend of traditional Samoan culture with modern American amenities that make it irresistible. Rainmaker Mountain seen while sailing into Pago Pago Harbor in American Samoa. The capital, Pago Pago, may be better known than the country itself. I think the familiarity comes from the Apollo flights (10, 12,13, 14, and 17) that splashed down close to American Samoa, with their astronauts being initially brought to the main island. 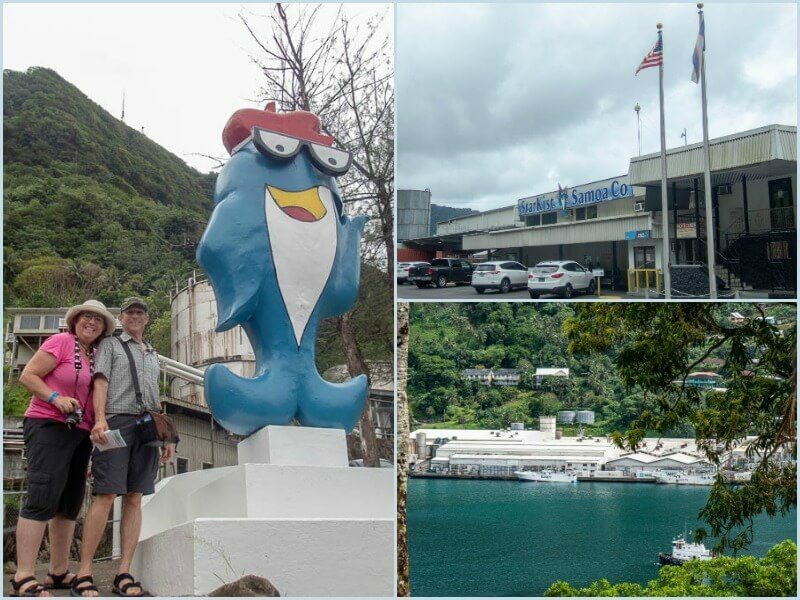 We arrived in Pago Pago on a Princess Cruise sailing from Los Angeles, California to Auckland, New Zealand and stopping at ports in Hawaii and French Polynesia, as well as American Samoa. 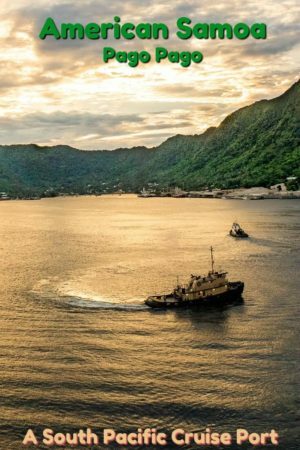 Pago Pago cruise port is an easy destination to walk off the ship without a plan as there are plenty of things to do when visiting American Samoa. 8 Tempted? Will you be visiting American Samoa? 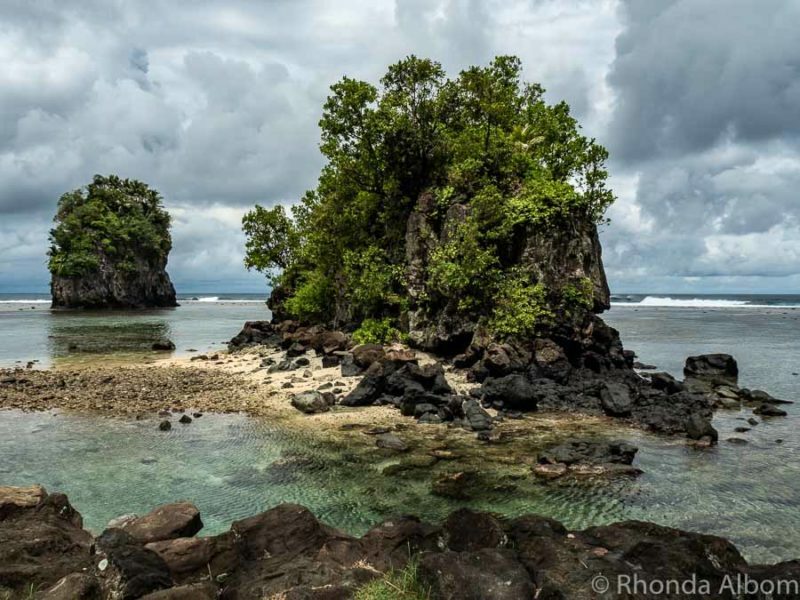 US National Park chasers know of American Samoa, even if they haven’t made it here yet. The National Park of American Samoa is the most remote of the US National Parks and is the only one in the southern hemisphere. If that’s not enough uniqueness, it is also the only United States National Park not owned by the US government. Instead, it is leased (for a fee) from the eight villages that occupy the land. And, the local villagers continue to use the area. 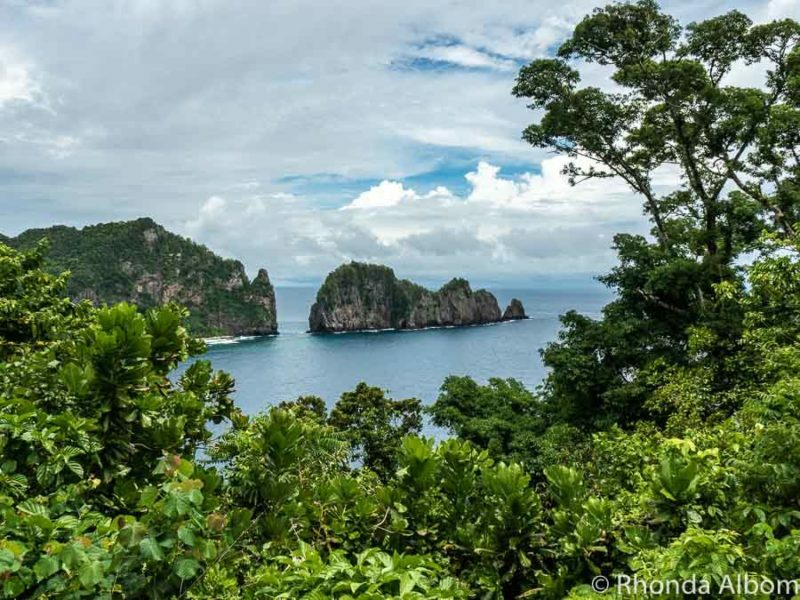 Aside from incredible views, there are three hiking trails from the Vatia lookout. Two go down to beaches, while the the third leads to Maugaloa Ridge. 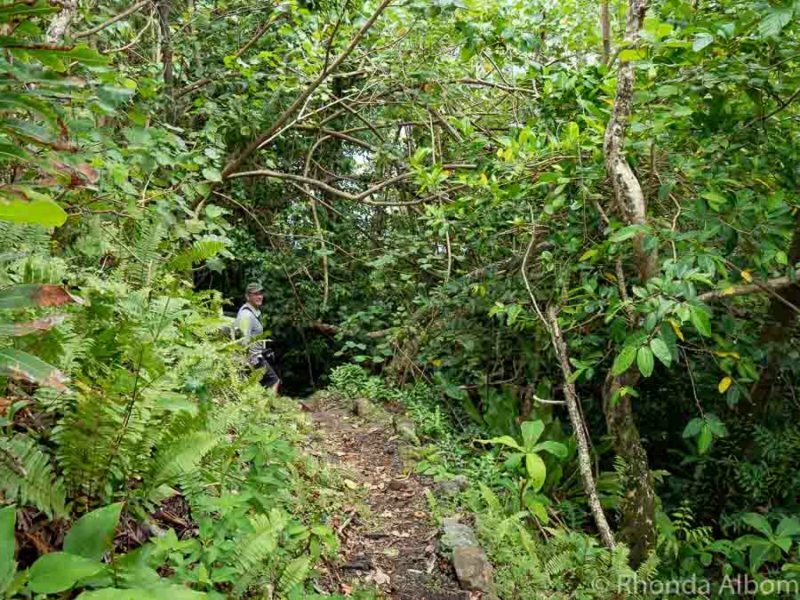 Jeff near the top of a somewhat steep, hour-long hiking trail that leads down to a beach in National Park of American Samoa. To demonstrate their bravery, young tribal men used to climb to the top of Pola Island. Today it is an active and protected seabird nesting area, home to noddies, frigate birds, and brown boobies. 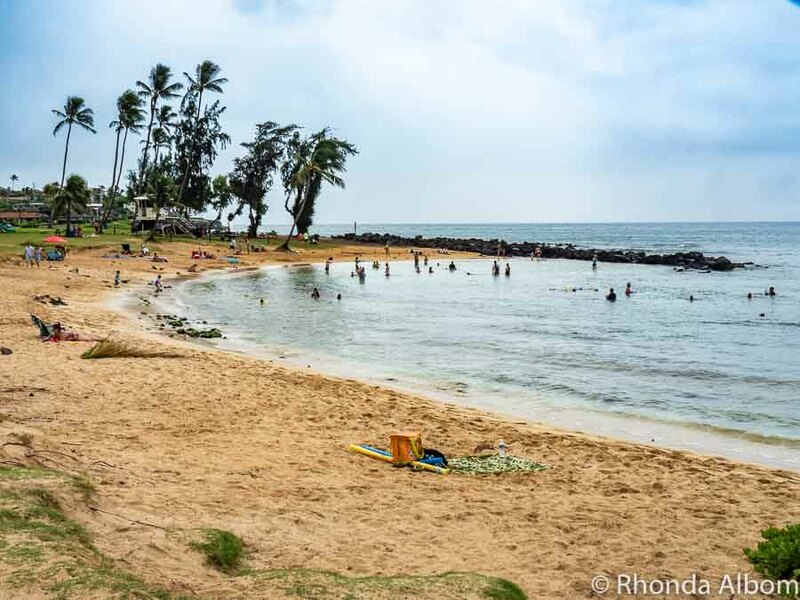 A charming and typical beach town that can be driven or hiked to from the lookout. It’s an example of the mix of modern housing and amenities with traditional Samoan life. Located inside the National Park, the village gets regular payments from the US government for the use of its land. The village upholds traditional customs like Sa, a time at dusk dedicated to prayer and contemplation. Like other villages we passed through, an old welding tank is used as the town bell. It is rung three times nightly: first is the five-minute warning; second at the start of Sa; and, again to signify the end of Sa, about 15 to 20 minutes after it began. If you are visiting American Samoa, you will want to respect this tradition. This is the bell in the village of Vatia. 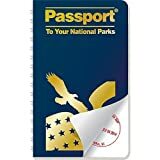 Tours can be booked at the National Park Visitor Center, or just stop in to get your National Park Passport stamped. Visiting American Samoa often means getting rained on, especially in Pago Pago Harbor. This is due to Mount Poia which is nicknamed Rainmaker Mountain because the clouds get trapped at the top of the mountain, producing up to 200 inches of rain annually. 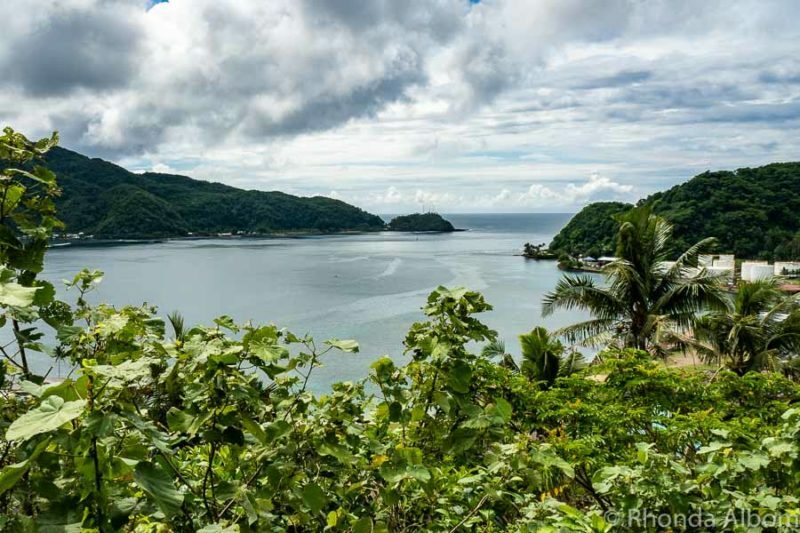 As a result, Pago Pago Harbor has the highest annual rainfall of any harbor in the world. Rainmaker Mountain on Tutuila Island in American Samoa – Seen from Afono Pass lookout (the lookout point is in the National Park, Rainmaker Mountain is outside the park). Mt Matafao, the highest Peak on Tutuila Island in American Samoa is a National landmark, seen here from Afono Pass lookout inside the National Park. 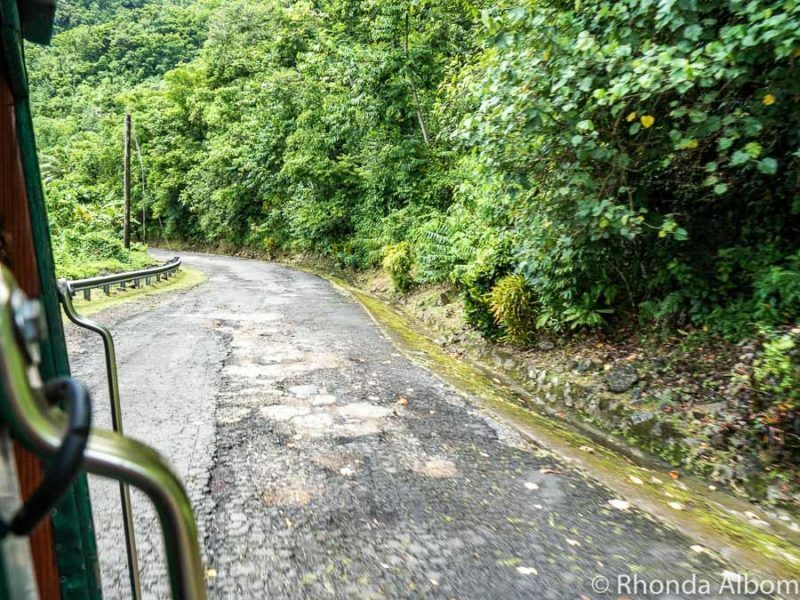 While the roads in Pago Pago are paved, this is the road coming down from Afono Pass lookout (seen from the moving bus). 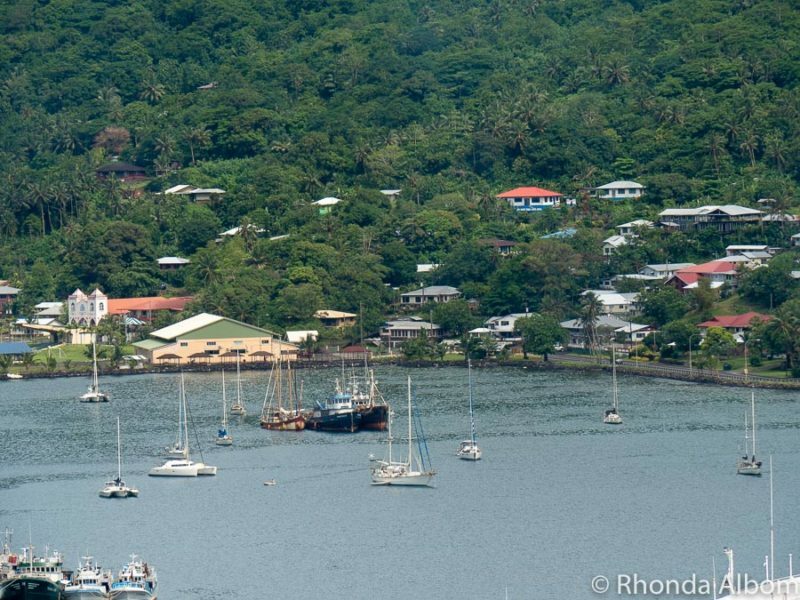 Pago Pago is the capital of American Samoa. It’s the largest city by both land mass and population, and it is home to the cruise port. If you arrive via cruise ship, you can take a ship’s excursion, join a tour at the dock, hire a private taxi, or walk to town on your own. We joined a three-hour fabulous tour with Tour American Samoa which took us to all the sites on this page outside of walking distance. Walking to the right will bring you to small towns, the museum, and the market. Turning left out of the port you will find the Ocean Center, beautiful white sand beaches, and more cafes. 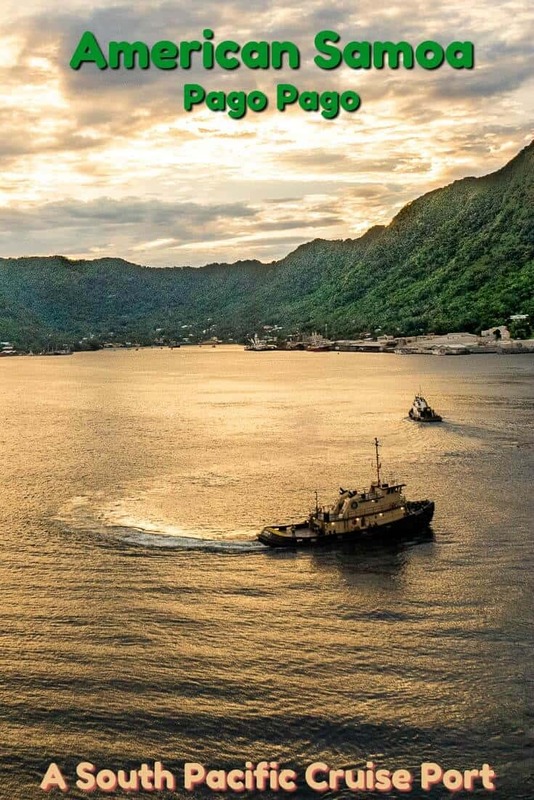 Pago Pago’s deep, well-protected harbor is what first attracted the United States in 1839, and it took a while to formalise an agreement, finally creating the US territory of American Samoa on April 17, 1900. This is not an aquarium, but rather a learning center. Home to the only NOAA ‘Science on a Sphere‘ in the southern hemisphere, The Tauese P.F. Sunia Ocean Center is a place to discover Samoa’s natural resources and to become more ocean aware. 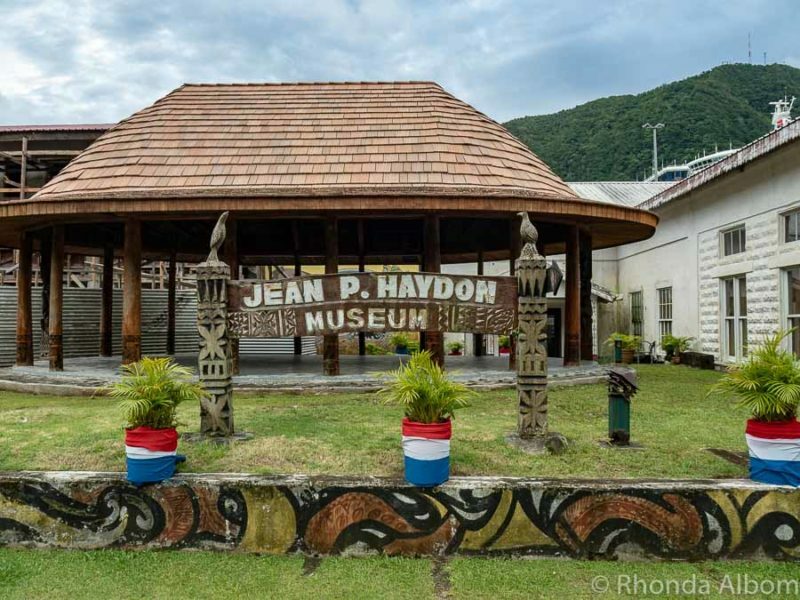 It’s free to visit and only a short walk from the Pago Pago port. The Ocean Center is responsible for the protection of 13,581 square miles of ocean in six marine sanctuaries. 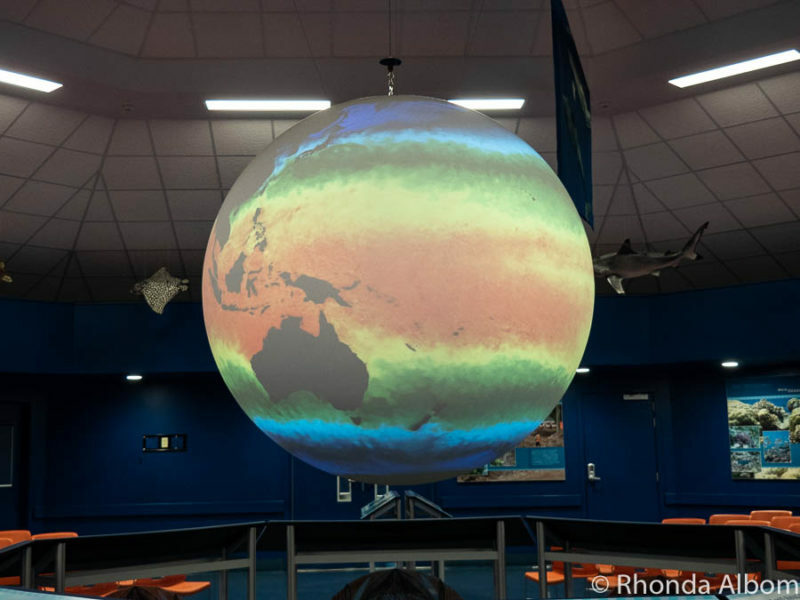 The only ‘Science on a Sphere’ in the southern hemisphere is at the Ocean Center in Pago Pago. 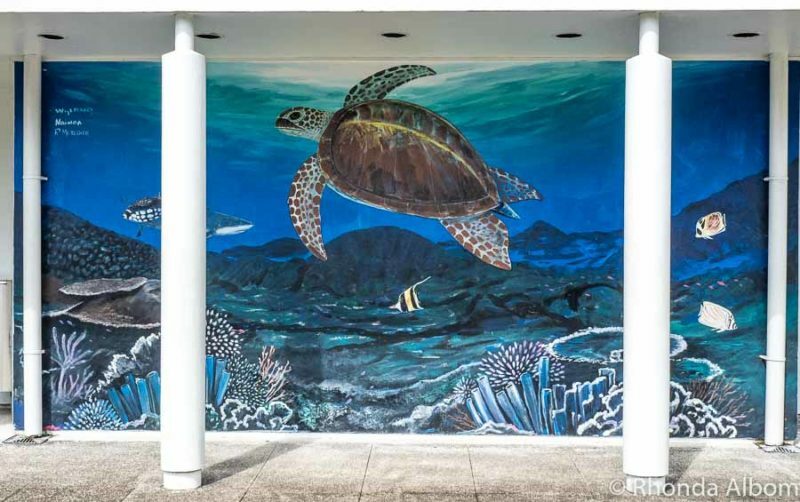 A mural by Wyland hangs outside the Ocean Center. Jean Haydon is the wife of the governor who welcomed the Apollo astronauts in 1970. Today the museum is not only the place to see Samoan artefacts and handcrafts, it is also an opportunity to see the moon rocks and the actual American Samoan flag that was carried to the moon on Apollo 11. The museum is going through a significant expansion and was closed when we visited. We always like to step off the beaten path and, whenever possible, participate in local life. Meeting locals, walking down side roads, and stopping into local shops are some of our favourite things to do in a new destination. It’s more difficult in a cruise port as we have time restrictions. 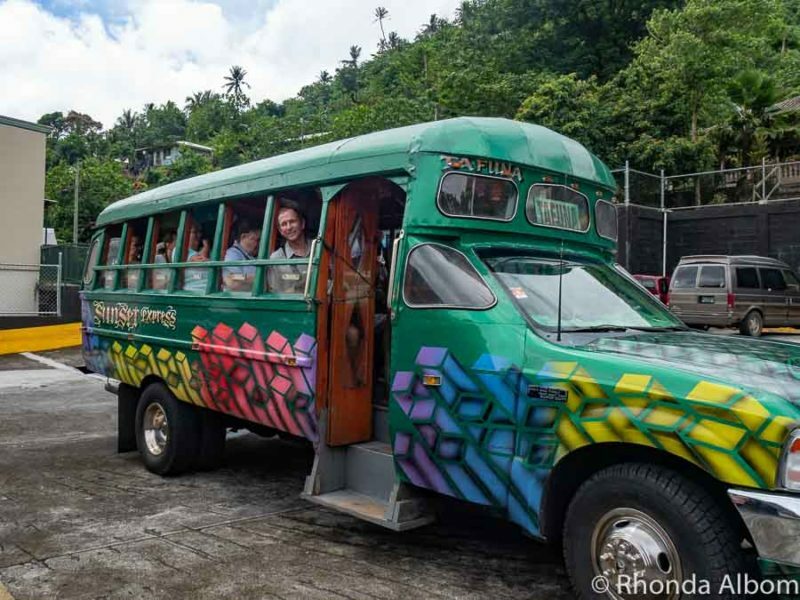 Aiga are the family-run bus used for local service as well as tourism. Look in the front row and you will see Jeff. There are Fale in every village. I believe this one belongs to the Paramount Chief of American Samoa. Everyday life seen in Pago Pago. The last photo has students in their school uniform. As we took a cruise to American Samoa, we had only one day to see the highlights. 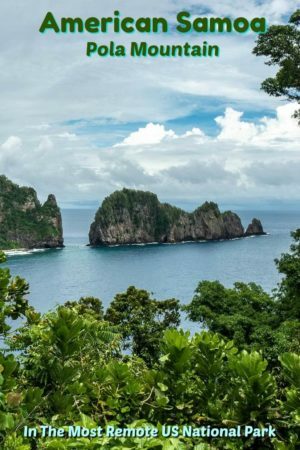 We made sure we saw Pago Pago Harbor from up high, got into the only American National Park in the southern hemisphere, stuck our toes into the sea, and visited the Ocean Center. Standing at the cliff edge looking 5,100 feet across the bay, I am not sure how I would have felt about taking the aerial tram if it were still operating. The historic tramway operated from 1965 to 1992. Rising from 191 feet to 1612 feet it took employees and tourists from the city side to the television transmitter across the harbor. It was severely damaged in 1980 when a p3 Orion clipped the tramway cable before crashing into the Rainmaker Hotel below. Unfortunately, none of the eight onboard the plane survived. (Left) An abandon aerial tramway car with the television towers that it once travelled to in the distance. (Right) The memorial to those who died in the plane crash of 1980. From the aerial tramway lookout, we can see both Breakers and Blunts Points, both which are home of the former military gun encampments, with cannons still in place. Breakers point (left) and Blunts point (right) seen from the Aerial Historic Tramway in Utulei on American Samoa. A fisherman named Fatu was out at sea fighting off a shark when his wife Futi approached the shoreline. Worried about her husband she began to enter the water. He called out to her to stay away, but she didn’t listen. In an effort to save her he turned himself into a vast rock situated between the shark and his wife. She became so distraught, she also turned herself to rock to always be near him. Today the two rocks are named Fatu-ma-futi, the word ‘ma’ translating to ‘and.’ They overlook the entrance to Pago Pago Bay. Employing nearly 80% of the population in some capacity, Starkist Tuna dominates the harbor’s north shore. The industry utilises fisherman, dock workers, factory workers, people to check and repair nets, drivers, and more. Honestly, you will smell it, just before you see it, but the stench didn’t stop us from getting out of the bus to take a photo with Charlie. This is the fourth largest tuna canning company in the world. Despite the fishy smell in the air (and the threat of rain), we couldn’t resist getting off the bus to have our photo taken with Charlie at the Starkist Tuna Cannery. Remember always to look up, and you never know what you will find. 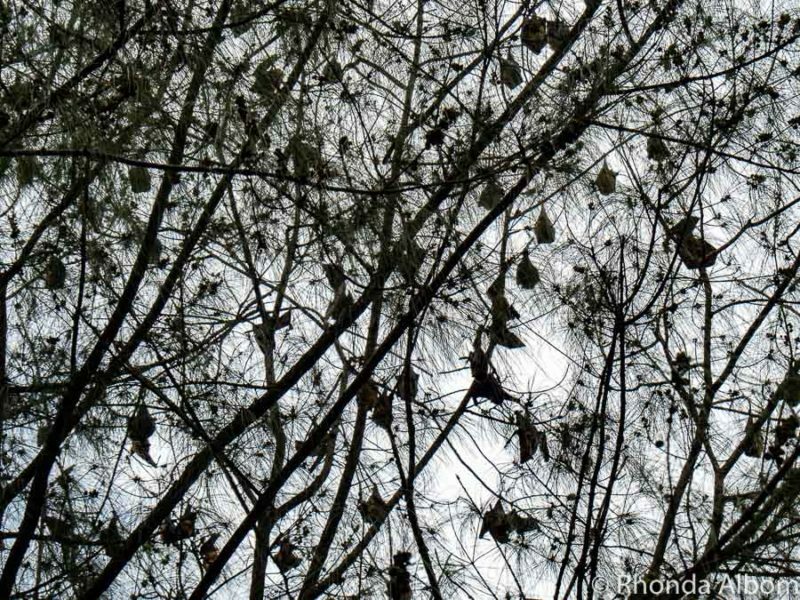 Most of the bats we saw are common fruit bats, often called the flying fox. We were shown a bat roost during our tour and stumbled upon a second one near the Ocean Center. Wow, that’s a lot of bats! If I could, I would have stayed longer. There are not a lot of options, and in town, Sadie Thompson’s Inn is the most popular. Located about 2600 km south of Hawaii, American Samoa is the only American port in the southern hemisphere. Getting there isn’t as easy as one would think, with direct flights offered only from Honolulu (Hawaii) or Apia (Western Samoa). Flying to Apia from either Sydney or Auckland is easy. We arrived via Princess Cruises as one of only 17 cruise ships that will reach Pago Pago this year. This is up from 15 in prior years, but still well below what the island’s tourism could handle. Private yachts frequently visit as evidenced by the many small and mid-sized boats in the harbor. Private yachts and fishing boats seen from the Aerial Historic Tramway. Samoa and American Samoa are two separate groups of islands. Samoa is often referred to as Independent Samoa or Western Samoa. (I used Western Samoa above to avoid confusion). Five main islands and two coral atolls make up American Samoa. Tutuila is the main island and is home to the capital (Pago Pago). Ofu Island is considered to be the most beautiful and, according to our guide, has the best beaches. The island of Ta’u is 100% solar powered, and the goal of American Samoa is to be operating on 100% renewable energy by 2040. In Samoan, the letter g is pronounced ‘ng’ therefore, the capital city is pronounced ‘Pohng-oh Pohng-oh’. While Western Samoa has it’s own currency, American Samoa uses US Dollars. Tipping is not typically done in American Samoa. Pago Pago Harbor is .6 miles wide and 2.5 miles long. People born in American Samoa are United States nationals (not citizens). A somewhat traditional society, it is polite to cover up if you are away from a beach. American Samoa weather is tropical. Located just 14 degrees south of the equator, it is hot and humid. However, the best time to visit is June, July and August when it is slightly cooler and dryer. There are two official languages on the islands English and the Samoan language. 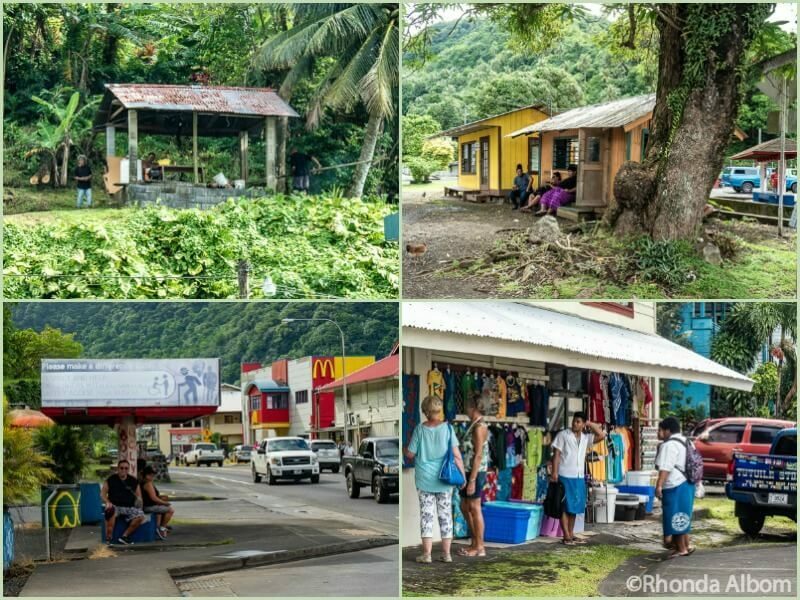 For free WiFi in Pago Pago head to Fagatogo Market, the Public Library, or McDonald’s where you will find a few interesting options on the menu like Portuguese sausage or Spam and rice. Tempted? Will you be visiting American Samoa? Disclaimer: We worked with Visit American Samoa, the local tourism board. 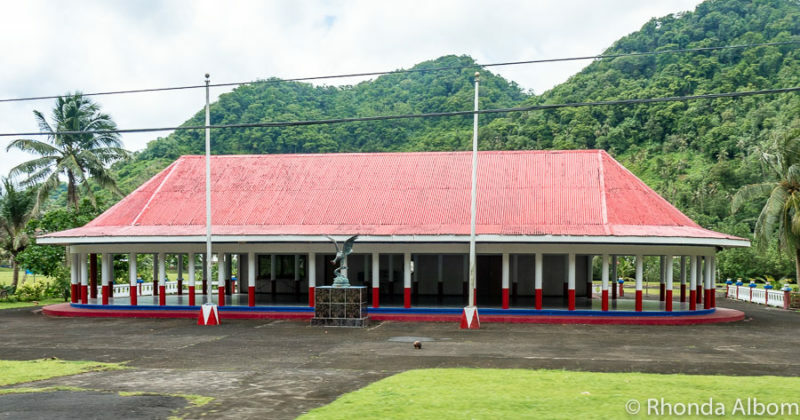 We were provided with complimentary entrances, a fabulous tour with Tour American Samoa, and sample items to assist in the writing of this review. The options expressed here are strictly our own. It does feel rather exotic when we were there. I had to keep reminding myself that it was actually part of the USA. What a beautiful island, very plush green with many trees. Is there definition for Pago Pago or jut the name? I would have liked to have seen a photo of your Princess cruise ship. See ya Rhonda. What an amazing journey, Rhonda! I am not a great fan of cruises, but you made me really curious about this one. I’d love to see the American Samoa too. 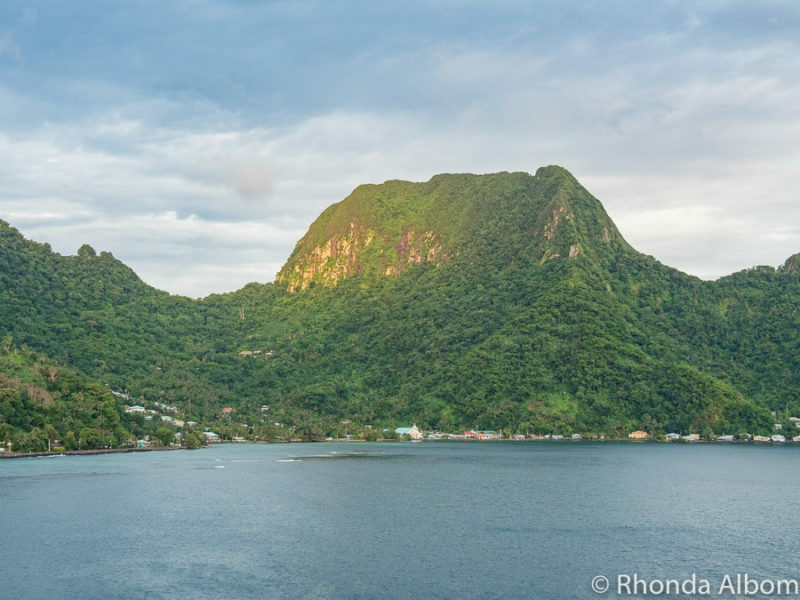 Pola Island looks fantastic and so does the National Park of American Samoa. If we could end up in Aukland and spend a few days there too, it would be a great trip. It looks like you had a lot of fun on this trip. Such lovely views as seen in your photos here. Well with all that rainfall it’s no surprise that everything is so lush and green. I’m glad to see there are more places now established to show the history and culture of the Samoan islanders. I bet the seafood and tropical fruits there are wonderful. I’m sure that tuna is plentiful in the South Pacific, but I would have never thought that you would find a Starkist plant in American Samoa. I didn’t expect the island to be as developed as you indicated by your post. For example, the McDonald’s surprised me too. Thinking about it, it does make sense that Starkist would be where the tuna are, and as for McDonald’s, that is part of the American influence. So exotic and beautiful! I would love to visit American Samoa. It was interesting to also learn the differences between American Samoa and Western Samoa. It’s an interesting mix of exotic and familiar. Reading your post, I was thinking ‘this place sounds interesting’ we should look into going there. David and I love visiting islands so it sounded worth investigating. Then I got to the bit about how you get there – oh well. We can’t ocean cruise because I suffer from chronic seasickness. Maybe one day we will head to Hawaii again and fly from there. Or go from Apia in Western Samoa. I am pretty sure you can fly non-stop from Sydney to Samoa, then fly over to American Samoa from there. Wow. Living in the UK I’d heard of American Samoa but didn’t know much about it. I know more now and would love to visit! It’s probably never going to happen but at least I’m au fait with the capital, and its pronounciation, now. You never know where life will take you. We discovered this island as a cruise port. Hmmm. This cleared up many things for me – I’d heard of the National Park, and Pongo-Pongo but didn’t know that’s how it’s said but spelled Pago-Pago. I learned alot from your visit! Looks like a very cool place to visit. I think you are opposite of many people who have seen the spelling of Pago Pago, but didn’t know how to pronounce it. No I hadn’t heard of it, how interesting, particularly about the Apollo flights. I guess the flights had to splash down somewhere rather remote, so an American territory in the South Pacific is perfect. I really like the beaches and I would like to spend some time there to relax and look at the sea. I have the sea quite far away, so it’s always a big attraction for me. I live by the sea, yet it is still a bit attraction for me too. I wish I had more time there to get in a good days snorkelling. As it was, I only had time to enjoy the white sand and stick my toes in the ocean. You’re right, I didn’t know it existed, but it looks like an idyllic paradise. The view from Afono Pass lookout looks absolutely incredible. Don’t feel bad, you are in the majority. Not all of the Apollos, seems that 11 wasn’t on the list, even though they carried the American Samoa flag all the way to the moon. I’ve often heard of American Samoa, but really don’t know much about it. Thank you for sharing your experiences in this fascinating, beautiful and remote place. I was the same before we arrived. American Samoa turned out to be a wonderful surprise. These mountainous landscapes remind me a lot about Norway. Same green mountains and fantastic views. Maybe the landscape, but the weather sure is different. It is hot, humid, and rains a lot in American Samoa. Now I am trying to figure out if I’ve ever heard of American Samoa… I love everything Pacific 🙂 You’re so luck to be that close! 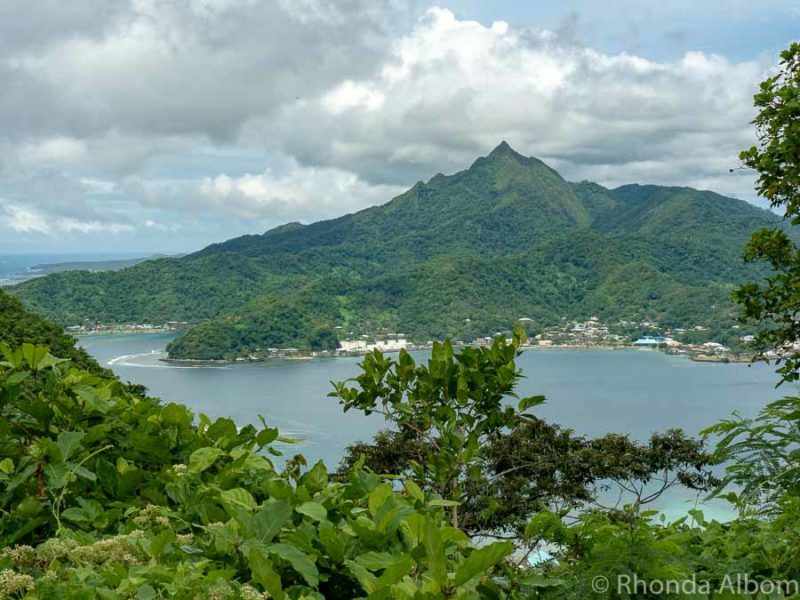 You may have heard of Pago Pago, the capital city. And, there are flights from Hawaii to Pago Pago. I really enjoyed my time in American Samoa. There is a lot of history here mixed in with all the tropical beauty. I’ve never heard about the National Park in American Samoa. It looks like a beautiful place to explore. 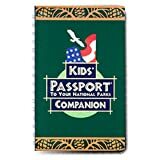 The National Park draws many for its beauty and the challenge to get the park stamp. Oh, your photos really took my breath away! This is amazing. I’d never even thought of American Samoa, but it’s sure on my radar now. Yes, American Samoa is beautiful and interesting. I was happy to get the chance to visit this relatively unknown territory. I have now visited both Western Samoa and American Samoa. They both are tropical paradises yet each a bit different. Interesting tidbit: many of the workers at the tuna canning plant are from Western Samoa because of a large difference in the minimum wage and the favourable foreign exchange rate. What a treat? To be 1 of 17 cruise ships to stop here is amazing insight. Firstly, might I just say, that cruise sounds pretty epic in the first place… I mean to travel from LA to Auckland by ship is quite a distance! I hope it wasn’t too choppy and was enjoyable. Now for American Samoa, for me, the Aerial Historic Tramway sounds like something I’d like. Odd I know, but I quite like visiting abandoned things but the real treat would be the flying foxes. So that’s what Pago Pago looks like. Ever since I read a story about Pago Pago in 7th grade English 500 years ago, I have thought how cool it would be to visit there. 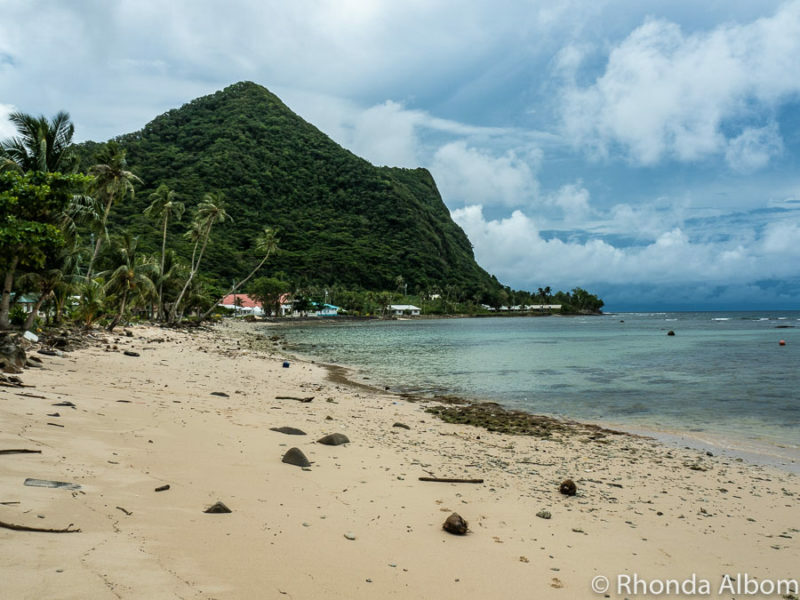 It was not on my bucket list but visiting American Samoa was an unexpected surprise. Oh how beautiful. This looks like a great place to visit. I bet you had a blast! I had a lot of fun and could see spending more time there to explore more of the island. This looks like an amazing part of the Earth. I haven’t been there, but love lush green places and nature. I would definitely go for the hikes there. I wish I had more time to do some of the hikes. The tropical flora is beautiful. I enjoyed this thorough blog post! It was so fun to read. I am ashamed to confess I had never heard of American Samoa, so this was amazing to read and learn about it. It makes me want to go! Pago Pago is probably the most famous part of American Samoa. Once you travel away from the city, you are immersed in tropical greenery. I’ve heard of Samoa until I read your post! I enjoyed reading about your experience! I am adding this place to my bucket list now! I only wish I had more time to explore in this port. 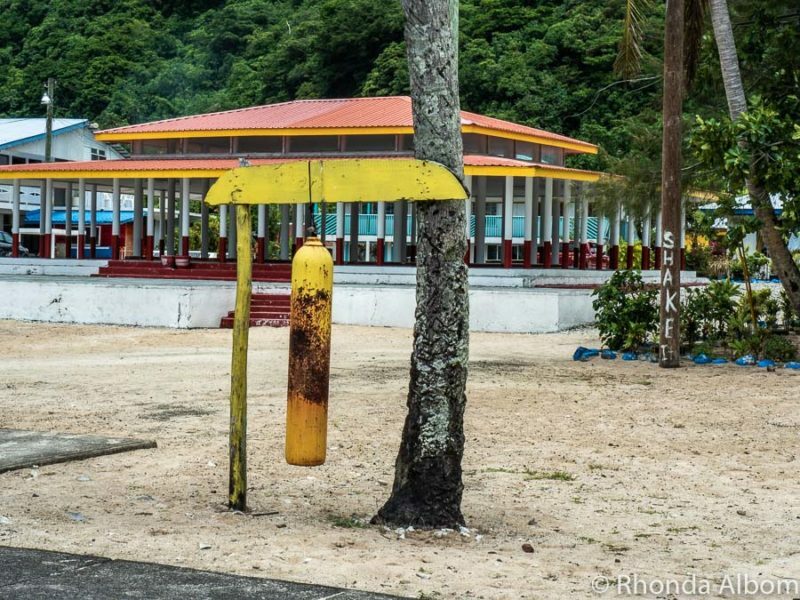 It’s fun to learn so much about American Samoa along with your beautiful photos. I had no idea there was a U.S. National Park in the area and that it’s rented from locals. Sounds like an interesting situation and I wonder how it plays out from time to time. Thank you once again for inspiring me with your beautiful photos! The flower pot rocks are my favorite. Thanks Brooke. I also had fun learning more about it while we were there. Your photos are stunning! We’ve always wanted to visit, but the travel time from Wisconsin is so long! Maybe one day!! LOL – we visited as we sailed from the USA to New Zealand. It was a cruise port with Princess Cruises. This place has that South Pacific feel Rhonda. From the fruit bats to stunning water, to lush forest to those small scale centers of towns, it looks similar to my time spent in Savusavu. Way cool experience. In someways it reminded me of Western Samoa, and in other ways it was very different. A bit of South Pacific mixed with American culture. Flower Pot Rocks are rather cool. So much greenery and vegetation. And is it wrong I am still chuckling at boobies? LOL – I think a lot of people are still chuckling about the boobies, but they just won’t admit it. Lots of beauty here. Great shots. I’d be near the water. Or perhaps on a boat. My favorite thing to do. It’s a fabulous island for boaties as the main harbour is long and protected.